Dorothy L. Sayers (1893-1957) was education at home and for a short time at the Godolphin School in Salisbury followed by Somerville College Oxford, studying Modern and Classical Languages. Dorothy worked all her life: first for an advertising agency then as the successful author of detective novels. The invitation to write a play for the Canterbury Festival resulted in, Zeal for Thy House. Now her skill with words involved re-stating the Christian tradition, what C.S. Lewis called ‘Mere Christianity’. This first religious work displays Sayers at her best, treating the ‘drama’ of sin and redemption. The closing speech of the play leads to what is her greatest theological The Mind of the Maker (on the Trinity): the great reality in which we live, move and have our existence. Her later writings were greatly enriched by her study of the medieval Italian poet Dante, whom she first read to while away the hours of a wartime air raid. Her clear grasp of the great truths of the faith, her skill in presenting apparently ‘dull dogmas’ in clear and sparkling prose, leave us with a legacy of Christian wisdom which can still speak to the contemporary world. The presentation will look at some of the profound insights that Henri Nouwen made to contemporary spirituality. From his beginnings as a trained psychologist to his early death, Henri was always in search of meaning, a quest that brought him face to face with his own struggles. He moved from the position of being a psychologist delving into spiritual matters, to a person whose life long quest for God brought him peace and a profound sense of purpose. His peripatetic journey and his marvellous insights had a profound effect on the spiritual journey of those who lived through the excitement and then perhaps disillusionment that followed the Second Vatican Council. His early death finally led him to the God that his restless spirit yearned for. The contemporary French philosopher, Jean-Louis Chrétien, makes this observation about the life of faith. ‘We cannot tear ourselves away from the world to offer ourselves to God.’ This is a challenging statement. To try to offer ourselves to God without bringing with that offering, the world – the world of birds and trees, of morning light and evening darkness, of sea and sand, of sky and cloud, of grassland and desert, of ant and lizard – to try to offer the one, ourselves, without the other, the Earth – is to pull apart what belongs inextricably together. The world is where God has placed us. The world is God’s domestic artistry and architecture. In the time of the Anthropocene, when this world is under severe threat from human economic activity, the moment has come when, if we wish to hear the voice of the Creator, we must pay attention to the Earth herself as a primary spiritual guide. In Seamus Heaney’s Station Island, a confessor says to the poet ‘read poems as prayers’. In this presentation, I propose to read a small selection of poems by Paul Celan as ‘prayers’. Michael Hamburger, one of Celan’s English translators, points to the poet’s attentiveness to situation and world as itself a kind of prayer. For Hamburger, moreover, Celan’s poetry expresses a negative (or apophatic) theology. Born in 1920 into a Jewish family in Romania, Celan lost his parents in the Shoah, though he escaped arrest himself. His poetry since has stood ‘in the shadow’ of the Holocaust. Writing in German, he developed a poetic language to express the inexpressible. This presentation will explore his poetry, with references to examples such as ‘Corona’, ‘Assisi’, ‘Tenebrae’, ‘All Souls’, ‘The Straitening/Stretto’, ‘There was earth inside them’, ‘Psalm’, ‘Tabernacle Window’, ‘To Stand’, and ‘Once’. That there is reference to religious motifs in many of these works and their titles suggests a resonance between their being poems and their possibility as spiritual reading. In Celan’s work, the aftermath of unthinkable horror becomes the space for address to an unknowable, perhaps absent, other/Other. Ivone Gebara-- A Prophetic Voice – and Life! Ivone Gebara is a Catholic nun and a pioneering Latin American feminist liberation theologian. Her life and writings are seen to be prophetic and challenging, grounded as they are in the concerns of the poor and marginalized in Gebara’s own context, alongside her engagement and dialogue with global realities. Ivone Gebara’s own search for liberation, and for the liberation of others, shapes her understanding and articulation of a fresh and inclusive vision for theology and for social justice. Her life as a religious sister, as a theologian, as spiritual counsellor, teacher, writer, preacher... defies the traditional theological anthropology which still struggles to recognize that women, the poor, ones on the margins of society, (and not only those seen to be ‘privileged’, respectable and powerful) may truly reveal and represent God’s presence and grace in our world. Raimon Panikkar was attracted to mystical experience at an early age, and throughout his life, this influenced his work as a philosopher, theologian and cultural historian. His Catalan-Catholic and Indian-Hindu heritages enabled him to engage in both Eastern and Western perspectives, not only of mystical theology and praxis, but also of the global challenges of the twentieth and twenty-first centuries. The question being asked in this presentation is, what can we learn from him in our quest to live authentically as Christians and contemplatives in the world of today? In her short life, Flannery O’Connor (1925-64), did not suffer fools. This is part of the reason why her humour is so astringent. It is hard to get through her stories without laughing uncomfortably. She wrote slowly and thought long and hard about her craft. Her fiction was an expression of a profound and unsettling relationship with God; she read Thomas Aquinas every night to get to sleep. O’Connor lived most of her life in Georgia and draws on the broken world of the American south. This talk will focus mainly on the stories in the only collection published during her lifetime, A Good Man is Hard to Find (1955). John O’Donohue was a mystic with feet grounded in a limestone valley. For him faith meant our being encircled by the fire of love between God, Son and Spirit. The more you read his work, or go back to the poetry or stories, you seem to learn something anew about this relationship. His works continue to draw my own vision outwards with a sense that the generosity of God’s love is tireless and ongoing. Since my first encounter with the work of John O’Donohue in the 1990s I’ve always resonated with a sense of something very ‘elemental’ in his work: his spiritual wisdom is founded on an understanding of life that is premised on the concrete, visceral, our very makeup. Tonight we shall explore his life and his work via this theme of the elements: of earth, water, air and fire which ripple through his works. For Merton there was no separation between the past, the present and the future; it was all now. It was how you lived your life now in relation to those you shared the world with that mattered. Wisdom was timeless and intersects all of time at the same time. Everything was Zen and Wisdom, and there was no thing that stood alone or remained outside of time. Zen was the essential essence or truth of all things. For Aboriginal spirituality the dreaming is not a far off place disconnected from the now. The Dreaming is the every, then of all that exists; or more accurately it is the experience of all that has, does and will exist right here, now. This paper will look at Merton’s thought, his understanding of Zen and the interaction with the Aboriginal concept of the Dreaming to provide a stepping off point for engagement with Aboriginal understanding of time. In 1950, Dom Henri Le Saux OSB (1910-1973) founded an ashram in India together with Rev. Jules Monchanin. He took on the name Abhishiktananda (‘Christ’s bliss’). His encounter with India amazed him, especially his meeting with the great Rāmana Mahāṛṣi. He was ‘blown over’ when he saw the sacredness of the Hindu tradition, especially the Vedānta of the Upanishads. This created a spiritual crisis in him that proved to be very fruitful. He set on the path to exploring the spirituality of India and its connection with his own Christian faith. This gave rise to several books that have attracted immense and on-going interest. Even his diaries are pored over. Fr John will present a selection of texts from his writings that show the richness of his thought. John will also explain how this meeting of religions can lead to discovering new depths in one’s own tradition. Susan's presentation will give an overview of the content of most of Cynthia Bourgeault's books before focussing on two particular aspects of her thinking - The Wisdom Jesus and Centering Prayer. It will end with a short liturgy from 'The Meaning of Mary Magdalene'. Ruth Burrows is a Carmelite nun living in Norfolk in England. She is 94 years old. This makes her modern, but modern in what sense? Ruth Burrows herself uses the word ‘modern’ in different senses in her own writing and it is these differences that are the starting points for this exploration of her life, her spirituality, and her understanding of time, place, and people. The paper will be heavily punctuated with her own words. Our policy is hospitality first. A special theological library dedicated to study and research in the areas of Spirituality and Mysticism. The collection is unique within Australia. Hours: Tuesday 12 noon - 8pm. Wednesday, Thursday & Friday 9am - 5pm. Closed Mondays. The Library catalogue is available via the homepage of the Library website, just click CATALOGUE. Our holdings can also be found on the Combined Library Catalogue UDcat the online search catalogue of the University of Divinity. 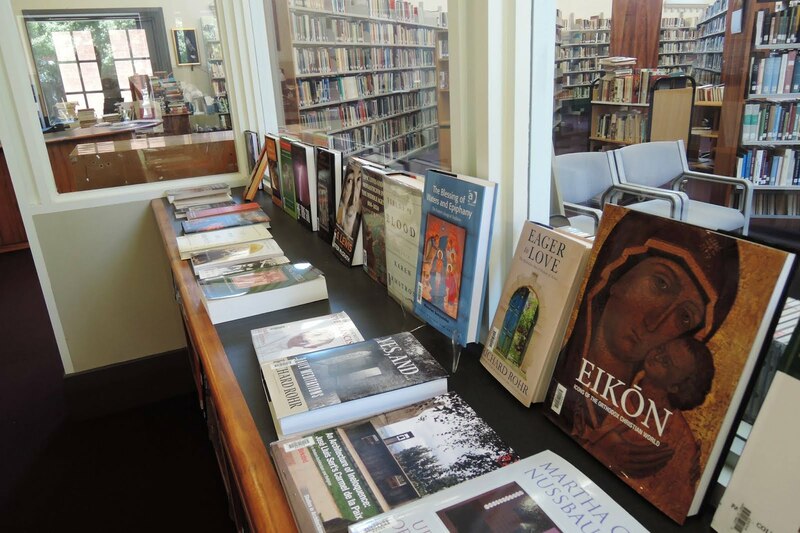 The Library is an affiliated member of the University of Divinity and a library of the Yarra Theological Union. 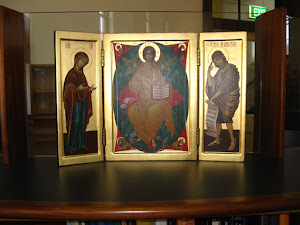 It is the Province Library of the Carmelite Friars in Australia-Timor Leste. The Library is housed in the spacious and handsome setting of the Carmelite Hall, ideal for study and reading purposes. Everyone is most welcome to visit the Library. Our policy is hospitality first. Library Staff: Philip Harvey (Librarian) and Susan Southall (Library Assistant). Volunteers: Angela Gallipoli, Kerry Johannes, Clare McArdle, Ceril Pereira, and Amanda Witt.